Since 1919, CELEBRATIONS has been providing top quality rental equipment and service to the special events industry. We service Private functions, Corporations, Gala benefits and work together with Montreal's best Caterers and Event coordinators. We have one of the largest and most comprehensive inventories ever assembled under one roof to which we are constantly adding to, on a regular basis, to better serve our clients with all of their rental needs. Operating under the name CELEBRATIONS, the group of BENCH & TABLE, LOCATION GERVAIS and PARTY TIME are committed as ever to doing whatever it takes to achieve total satisfaction of our customers, while maintaining our reputation for quality, value and 24/7 service. Each project is assigned to a highly qualified and experienced party rental consultant. Choosing items for an event can sometimes be overwhelming and we are there to assist you from beginning to end. We will work with you from the initial concept, through planning, budget development, delivery and installation. A support staff is there to back up our rental coordinators to ensure that every event an outstanding success. In order to manage each event properly and effectively, we use wireless radio to communicate and can provide service 7 days a week. We also have delivery, pick-up service available 24 hours a day, if needed. Our fleet of delivery trucks can easily deliver anywhere in Montreal and surrounding regions, including Quebec City and Ottawa. 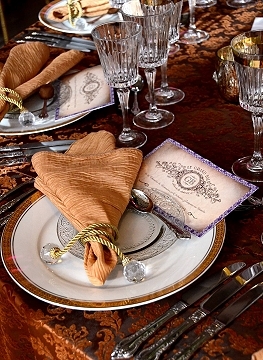 Also, we can ship our selection of linens, napkins and chair covers across Canada. All equipment is quality controlled for cleanliness, appearance and working condition. Because a guest or customer's first impression is always the most important, we maintain, service and repair our equipment on a regularly scheduled basis. All soft goods items are cleaned and wrapped in protective packaging prior to each rental. Our dedication in developing and bringing new products to the market is unsurpassed in our field. We keep over 8,000 different items in stock at our efficiently organized 50,000 square foot warehouse. By featuring a large inventory, including specialty items, we are able to serve all our customers large and small. We believe in technology, in order to save time and money for you and for us. With our in-house custom made computer system we are able to immediately identify the availability of each item from our inventory confirming that all the items reserved will be delivered as ordered. As an additional service, we can assist you in providing computer designed table setting layouts, thus maximizing space and identifying potential set-up problems. Staying within a budget is essential today and our party rental consultants will work together with you to provide solutions to any rental challenges your event may possess. For over four generations, CELEBRATIONS has developed numerous long-term relationships with an impressive variety of clients. We invite you to include your name to that long list and would be pleased at any time to provide you with the names of satisfied customers to ensure your trust and confidence.